The purpose of this thread is for us all to share tips on how to use twitter. It is quite a hard site to get your head around initially, so hopefully we can help each other out here. I'm going to give you a few tips of my own to start us off. You can find peoples account's by either clicking a link leading to their page, or by using the "Find People" button at the top and searching for them. Then you follow them by clicking "Follow" under their picture. These can be viewed by going to their profile (click on their name). The best way to find these is to find the @username link on the right hand side (above the Direct Messages link). 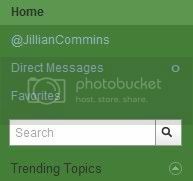 This will show what everyone has said to you/ in reply to you/ or about you in a tweet. Hover over a tweet that you want to reply to, and an arrow should appear. 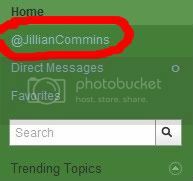 Click the arrow and it should take you to a tweet which starts off with the @username of the person you are tweeting to. Type in what you want to tweet and click reply. 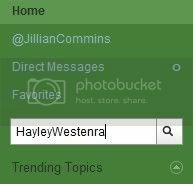 Alternatively you can just type in "@hayleywestenra" (or another username) manually and follow it with your tweet. (NOTE: This is a public tweet which is displayed on your profile page, NOT theirs). You can search for what anyone is saying about anything on twitter (publicly). Using the search function on the right, you can see what everyone is publicly saying to/about Hayley by searching for "HayleyWestenra". Or alternatively you could search for "Hayley Westenra" (with a space) to see what people are generally saying about her. You can only send these to someone if they are following you. Go to their profile page and click "message" under Actions. 1. Always remember to include the @username (e.g. 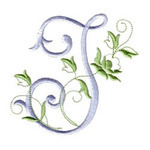 @hayleywestenra) in a tweet if you want to say something to that person. It would be virtually impossible for them to find otherwise. 2. Public tweets that you send never end up on someone else's profile page. They are only viewable by people that are following you in their "Home Page" (which shows the recent posts of people they are following). 3. Most people send public tweets on twitter. Direct messages are not useful unless you want to say something private. But please avoid Direct Messaging Hayley if possible. Wow, I've just noticed that Jillian has put together a very comprehensive and helpful tutorial of her own (with pictures!). I'm hoping she will copy that post here too! If you click the reply arrow, it is a public message. Here's a photo of the arrow in question. How Do You See Messages Replying To You? 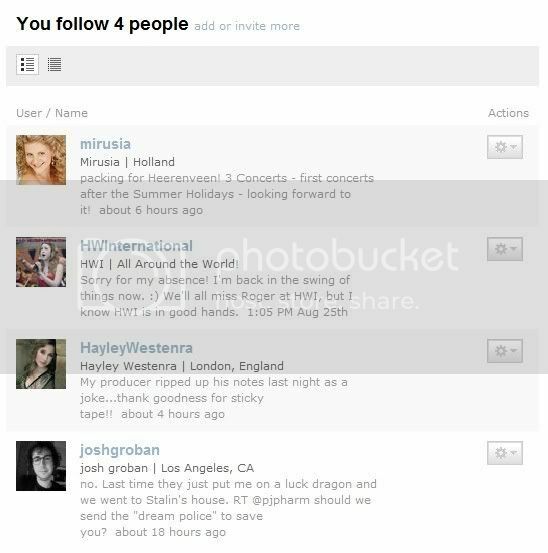 That way, if you send Hayley a message, she can see it that way. I don't think there's any harm in sending her a few messages -- I've looked at the number she's been sent and there's only been a handful to be honest. Also, she doesn't have to look at them unless she clicks the link -- I think that she'd find it interesting to see what people think of her tweets and then if she ever does find it overwhelming she doesn't have to look. At Jono's request I've added a few illustrations to his tutorial. Click on the link at the top right hand corner. You'll get a screen that looks a bit like this with the people you're following. 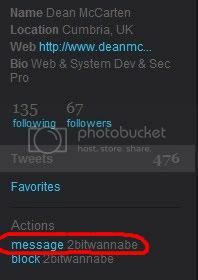 Here, you can click on the symbol on the right hand side to do actions such as block, unfollow, or mention the person. Mentioning is the same as replying to a message.. just generates an @hayleywestenra post. Thanks for posting this. I think I'm beginning to understand Twitter a bit better now. I think I'm getting the hang of tweeting and have to say I'm enjoying it, but what I don't get is why people you've never heard of suddenly end up following you! There are some that are fanatics or who are trying to sell you something - they're fairly obvious as they are following hundreds but have never tweeted Are these what are refered to a "Spammers"? I've also got several ordinary people following me for no apparent reason - I don't know them; they don't know me and we appear to have nothing in common. Yes, you've got it. The people that add you who you don't know will usually be spammers. Either that or they're just trying to build up their own follower list (by hoping you'll follow back). Another reason random people might follow you is because they wan't to receive your updates - but that would be unlikely unless they've got some relation. The good news is that they can't really hassle you unless you follow them back, so they aren't a threat at all. However, sometimes it's better not to have less than desirable "followers", so there is a way to 'block' them under your followers list. However, sometimes it's better not to have less than desirable "followers", so there is a way to 'block' them under your followers list. A question for Twitter experts! I've noticed that when you post a link in Twitter, Twitter replaces it with http//bit..ly/ (something) Is it possible to find what this will be before sending your tweet? Good question - and yes you can! Go to bit.ly/ - put in the link you want shortened, and it will give you the shortened link. There are other sites which do the same thing, but this one works fine! Thanks very much Jono - Very useful to know! So what's this new "List" idea all about? Haven't fathomed it yet so would appreciate some guidance. Search function seems to be 'broken' again! Wow this looks like an awesome feature! It enables you to separate the people you are following into smaller lists. For example, I can make up a list of my close friends, a list for HW fans, a list for news organisations...and then I can view the tweets on those lists. You go to create new list, give it a name, decide whether to make it public or private (up to you), and then you can go through the people you are following and add them to one of your lists. That's about as much as I've worked out so far...I think you can also recommend other people to add people in your list. Maybe someone else has more insight? Dean? Nicola? If I want to point someone on twitter to a page on HWI forum How do I create a shortcut? Left click on 'link to post' in bottom right hand corner of the relevant post, then right click to highlight and 'copy' the URL at the top of the screen. You can then paste into a tweet which Twitter should shorten. Note that it doesn't always work first time!